CE Mark For Robotic Catheter Guidance Control and Imaging™System . California-based Magnetecs Corporation, designer and manufacturer of robotic catheterization control systems for minimally invasive surgical procedures, has reported that the company’s Robotic Catheter Guidance Control and Imaging™ (CGCI) System has received CE Marking certification. 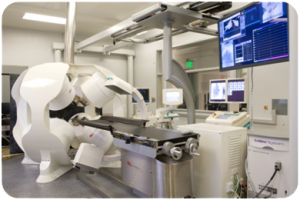 CGCI is a unified system for robotic guidance, control and imaging of catheters and other advanced tools used in electrophysiological and other procedures. Previous magnetic guidance systems use large, independent magnets which emit a substantial and continuous magnetic field, have limited control capabilities, and require shielding. In contrast, Magnetecs’ CGCI system creates an electromagnetic field that is largely contained in the electromagnetic array and focused in an area no larger than the patient’s chest. CGCI only emits a magnetic field when in use and can dynamically adjust and manipulate this field to safely and reliably achieve unprecedented three-dimensional catheter-guidance precision and responsiveness. The CGCI system is integrated with sophisticated cardiac mapping and navigation technologies, including X-ray, intracardiac echocardiography (ICE), and other advanced electrophysiology lab technologies and equipment. Magnetecs is planning additional applications of the Company’s electromagnetic technology in the fields of interventional cardiology, gastroenterology, neurology, and gynecology. CE Marking will enable Magnetecs to generate revenue from sales in Europe in countries that include the U.K., Czech Republic, Sweden, Italy, Germany, Switzerland, and Russia. The company is planning additional installations in North America in Montreal, Canada, Utah, and New York City in anticipation of the company’s FDA 510(k) submission.